I've finally gotten around to snapping a bunch of pictures of Kokoro, who is one of my favorite figures. I bought Kokoro on my birthday in 2009 (I think) from Amazon. She was on sale at the time for what I considered a reasonable $70. As it turns out, a quick Amazon search today shows a price of $180, so I'm happy I got her when I did. Kokoro was also my first cast-off figure and I learned some good lessons thanks to her. 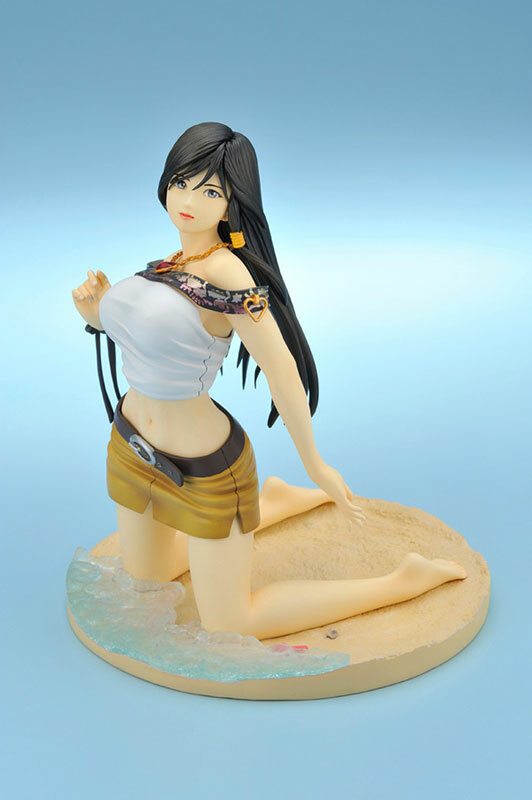 Like Kasumi, Kokoro is from the "Venus on the Beach" line from Kotobukiya. I assume both her swimsuits are taken from Dead or Alive Xtreme 2, but since I haven't played it, I wouldn't know. For reasons we'll get into in a minute, I keep Kokoro's alternate, cast-off outfit off. Definately one of my sexier figures, Kokoro has a sinuous, curvy body from virtually every angle. She looks like she's at a photo shoot (which is appropriate here). The umbrella you see is fully-functional and slides out of her hand. Unlike Kasumi, who shows detachment lines at almost every joint, Kokoro's entire sculpt is smooth and free of jarring breakage points. I like her base, too. The sandy texture is especially nice, and the floatsom thrown in add some detail. I wish the water was a little higher on the base, though, and she had more interaction with it. One of the things I absolutely adore about this sculpture is the level of detail in the feet and hands. You can make out individual muscle groups in her palm, and creases in the finger joints. The bottoms of her feet have clearly-defined arches, and Kokoro has pominant ankle bones. It's just lovely. You can really see the underside of the unbrella here, as well as the one cast-off seam on Kokoro's body: her head. We'll get to that soon. That umbrella is pretty cool--see the little wire pin? You can press down on that to make the umbrella collapse. The detailing on her bikini is pretty amazing, too. Not only is the color scheme nice, but you can see little creases at the center of each side where the loop runs through the fabric. Wonderful detail! The little beads that join the necktie are appreciated, too. And look at all that skeletal and muscular definition! Shoulders, clavicles, stomach and neck, all lovingly sculpted with actual human musculoskeletal anatomy in mind. You rarely see this in a pin-up sculpture. It's also worth mentioning that the bikini is tightly taught against Kokoro's breasts, creating a deformation along the sides (this is especially apparant on her left breast, above). I maintain that Kokoro does not have an oversized chest. Well, okay, compared to her in-game character model, she does. However, for this figure? Proportionately, I'm okay with it. Remember that they're being pulled up and together by her bikini. I think her face is wonderful here. She's not looking at you--she's got a far-off look in her eyes, which are wonderfully painted. Apart from Velvet (who we'll get to), Kokoro probably has the best eyes of any of my girls. I like her lipstick and size of her nose--both much better than Kasumi. You can also see one of this figure's only flaws from this picture: her hairtie has some smudged paint, and that's not from the cast-off process. Also, real quick, look at this girl's hands. Alright, let's get down to the cast-off story. Like I said before, Kokoro was my first cast-off figure. Thank Cthulhu she was so basic. You literally just pop her head off (as shown above), pop the necktie off, uncork the ties on her bikini bottom, and snap or wrap the pieces seen below onto her person. Then you put her head back on, put the ties back in, and voila--she's a new girl. Unfortunately, this costume is dull. It doesn't look like something you'd ever wear to the beach--it looks like one of Lara Croft's alternate costumes from some long-lost Tomb Raider game. The unsightly seems in the costume, on both the top and bottom, subtract from its appeal, too. But what's the worst thing about this cast-off costume? I'll tell you in the next paragraph. It scratches paint. See that wedge in the middle of the bottom's back half? You have to somehow cram that between poor Kokoro's legs before the two halves can slot together. It's a problem because it's not flexible, so the hard edges of that wedge run against Kokoro's thighs and, unfortunately, scratch up her skin. That's not a problem on her top, but her top does have it's own set of problems. Kokoro is made of pretty soft material, and every time (every time) I uncork her head, then put it back on, the process becomes a little easier. There's a little less resistance every time I do it. This makes me extremely worried, so I don't do it anymore. Remember how I said that I just keep Kasumi in the one bikini and never switch to the other one? This is why. I learned important lessons about cast-off figures from Kokoro. Now she almost never gets her alternate costume on. Since they're from the same line, I display Kokoro and Kasumi pretty close together. I kind of wish that all the Venus figures were sculpted to fit in a similar environment so that, at the end of the day, you could put them all in some kind of hazy diorama. But I doubt there's a pool five feet from the ocean, so it doesn't really work here. Also, gawd, look at that breakage point on Kasumi's thigh. It's just unsightly, and another reason I kind of disuade myself from buying cast-off figures. I do like that both girls are to the same scale (as they should be) and both have pretty awesome accessories/bases. A lot of loving attention went into both sculpts--something that I, as the buyer, really effing appreciate. Like I said at the top of the post, Kokoro is absolutely one of my favorite figures. I was able to get her for a great price, the detailing is mind-blowing, her expression is priceless, and it's just a high-quality sculpture all around. She's probably "out of print" at this point, but if you can find her, maybe online or in a comic shop for under $100, I highly recommend picking her up. Just be sure to decide which costume you like, then commit to it. She's about 7" tall, excluding the umbrella-ella-ella and came in a box so nice that I was reluctant to get rid of it. I should mention here that Kokoro was purchased largely thanks to the excellent photo essay/review of Tier over at Tentacle Armada. I'm a huge fan of his site and his photography (it's about a million goddamn times better than mine) and his reviews give me enormous insights into whether I'll want to buy a figure or not. So a big shout-out to Tier! Let's hear votes for the next review: Velvet from Odin Sphere or Tamaki Kousaka from 2Heart? Thanks for the kind words about my site XD I really like Kokoro, a lot of DOA figures iseem to have either blatant problems or inaccuracies but Kokoro looks fantastic. Her sculpt is great and I love her distant gaze. I vote for Velvet, there are a million Tamakis out there and I like Tamaki, but I haven't seen Velvet get a lot of love and she definitely deserves more.